The largest of London’s eight Royal Parks, Richmond Park (2,500 acres) has a varied landscape of hills, open fields, woodland gardens, thick lush forest and grasslands. It is home to the charming Isabella Plantation (garden of exotic plants), Pembroke lodge (beautiful Georgian mansion) and herds of Red and Fallow deer (650). 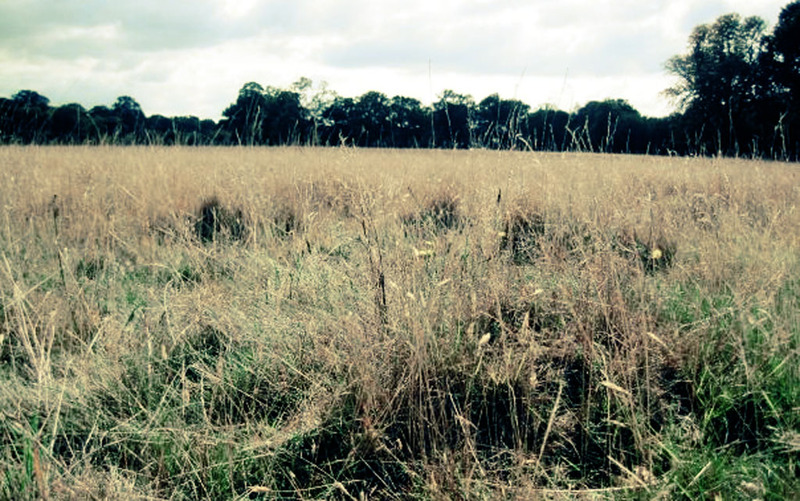 Wandering through Richmond Park’s huge open space of unkempt, wide land, among so many deer (who roam freely), it’s easy to forget you’re actually still in London. The park attracts all kinds of outdoor lovers – walkers, runners, horseback riders, cyclists, kite flyers, as well as folk who simply want to get out of doors, escape the hustle and bustle of Central London and breath in some fresh air. I recommend devoting several hours if not a whole day to this stunning parkland. I also suggest making a planned stop at King Henry’s Mound. Not only is it the highest point of the park but it is from this very spot that an avenue of trees force the eye along its path, providing an uninterrupted 10 mile view of Central London, all the way to St Paul’s Cathedral. This amazing vantage point did not happen by chance, it was designed in 1710 and is today specially maintained and legally protected, so that no future buildings can be built in its path and obscure the spectacular view. 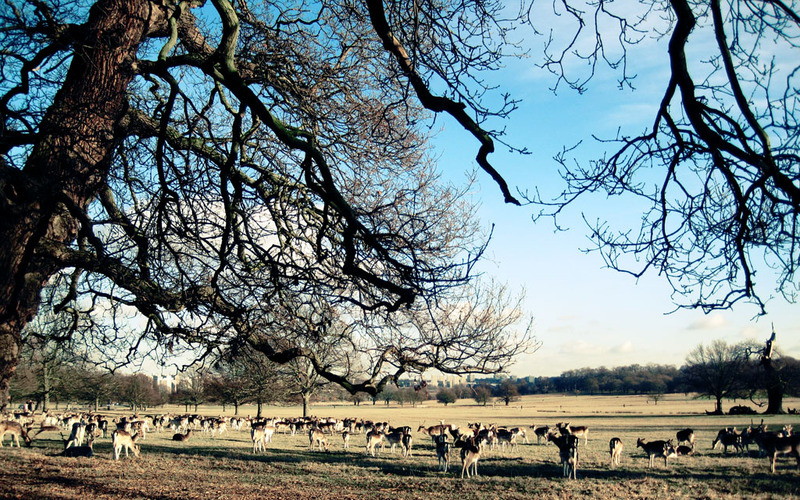 Enjoy a trip to Richmond Park for the fresh air and wide open space, and whatever you do, don’t forget your camera! 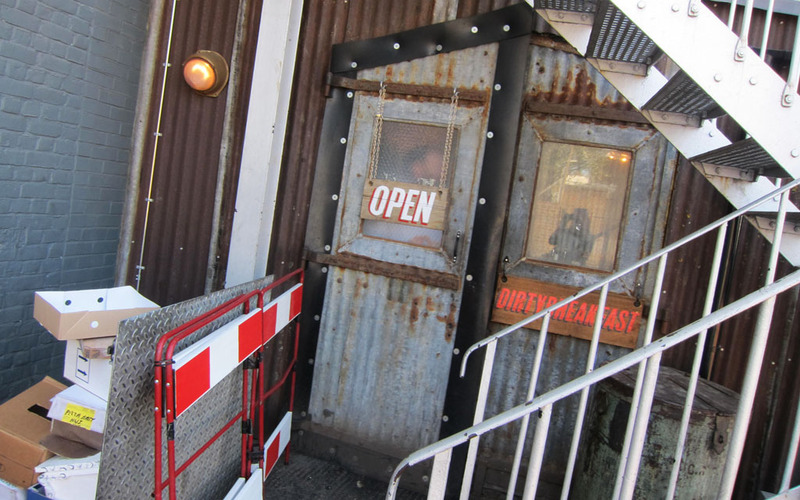 Opening Hours: The park is open from 7am in the summer and 7:30am in the winter. Gates close at 9pm. I had a feeling that I was really going to like Outsider Tart, even before stepping foot into the shop. An award-winning, authentic American bakeshop and café, run by two guys from New York and a counter top piled high with trays of freshly baked breads, cakes, cupcakes, brownies, sweet pies and tarts. What’s not to like? Those with a sweet tooth will absolutely love this place. Not only because of the range of treats but because of the outstanding variety of flavours Outsider Tart offers. Having said that, it is the huge selection of flavours that actually make it insanely difficult to order. Everything looks so incredibly good. Giant cookies, cakes covered in creamy frosting, cinnamon and sugar dusted cake doughnuts and gooey fudge brownies, just to name a few. On my visit, after a lot of ‘umming and arring’ I, perhaps over indulgently chose two (yes, two!!) slices of cake. 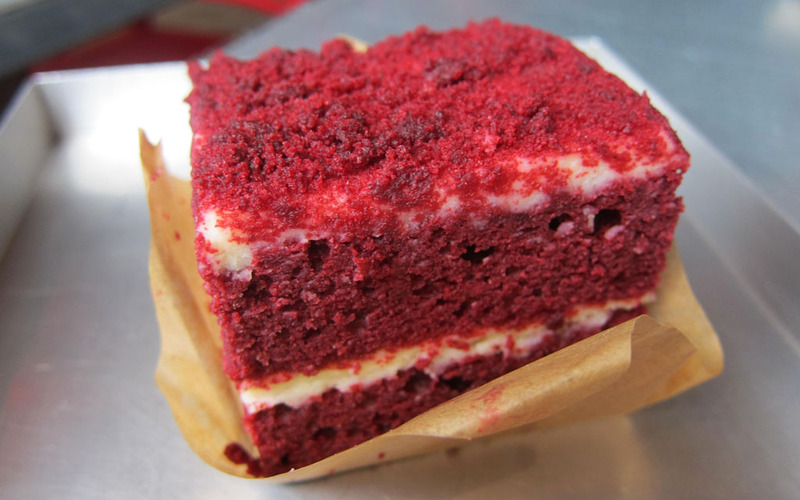 Red velvet and a chocolate chip cookie brownie. I mean come on, it was always going to be a rather dangerous pairing; me and an entire counter top full of delicious baked goods. Although the brownie was wonderfully rich, it was the red velvet cake with its mascarpone cheese filling that really hit the spot. 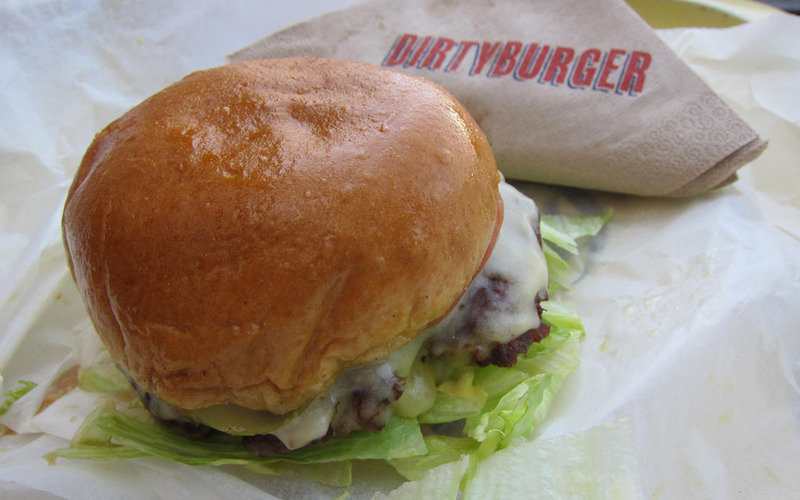 It was soft, moist and seemed to just melt-in-my-mouth. 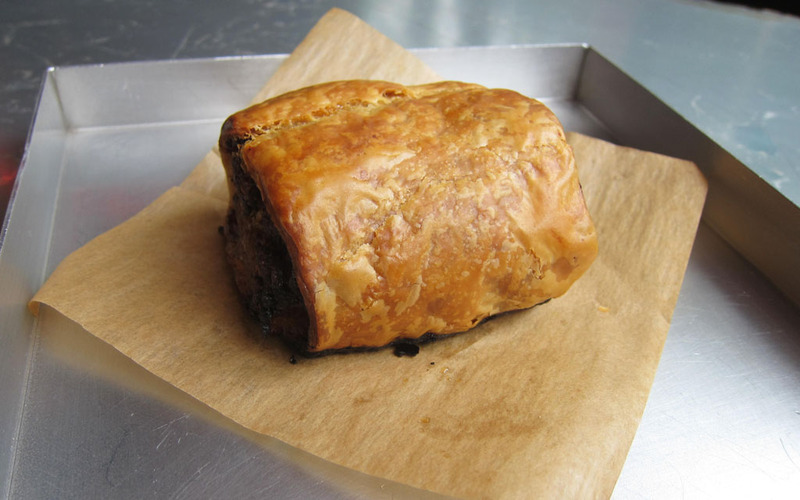 To balance out the sweetness, I also ordered a homemade sweet Italian sausage roll. Wholesome and bursting with flavour it was equally as scrumptious as the cakes! 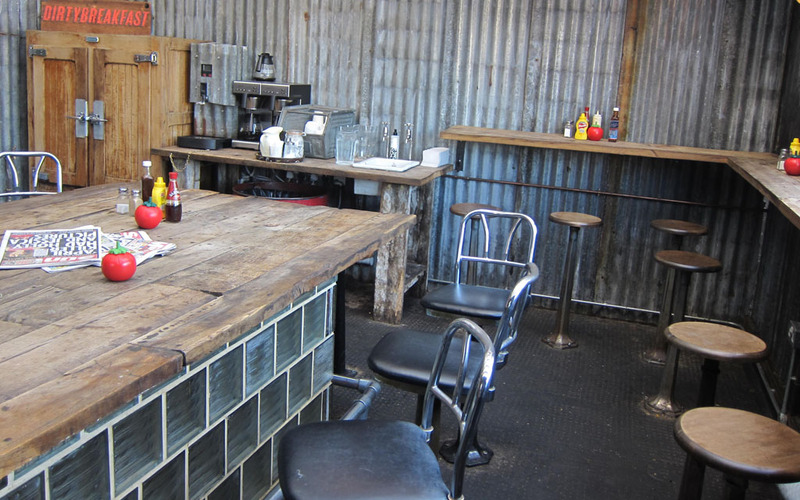 Whilst customers can of course take away, I believe Chiswick’s little slice of New York is best enjoyed by eating in, and pulling up a stool in the cafés casual and colourful surrounds. For those who cannot finish their cakes, ‘doggy bags’ are provided on request. Speaking of dogs, Outsider Tart also makes a range of dog biscuits. Strange but true. Aside from the cakes and dog biscuits Outsider Tart also sells an assortment of American products like, sauces, cereals, peanut butter and confectionary. 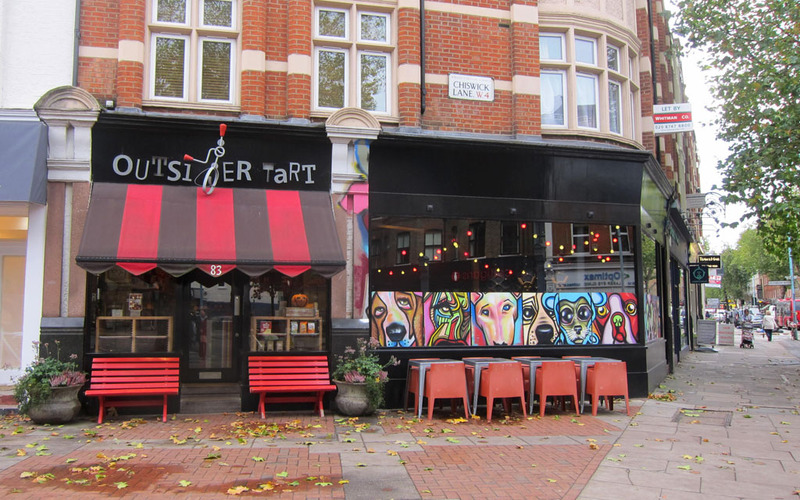 Overall, a trip to Outsider Tart is an excellent excuse to venture west, eat delicious treats, and explore Chiswick, which is a wonderfully leafy neighbourhood. Thank you Lynn for this great recommendation! Can't wait to check this out!! Thanks Jess!! Hels, you're going to absolutely love it! London has no shortage of things to do. No matter how long you have lived there for, there is always somewhere new to go, a restaurant to try, a sight to see, a market to check out, an area to explore etc… In fact there is so much on offer that it is impossible to do it all. Believe me I’ve tried! 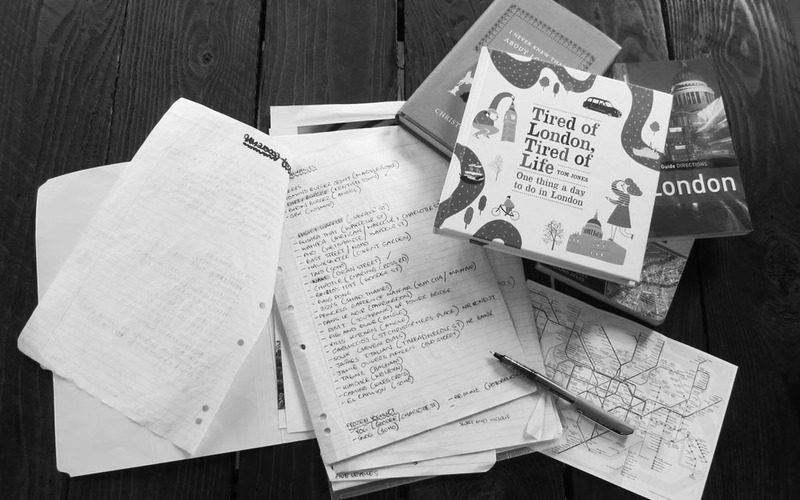 For me, like for the many expats who came before, London’s to do’s actually became a bit of an obsession. Often I would search through London magazines to find out what was on and where the best food, drinks, events, activities and attractions were. I would also ask friends about where they’d been, what they’d seen and where they’d eaten, and immediately I would want to go. Because of this, I was constantly adding things to my London to do list. Likewise, I was always crossing things off my list (the best part of any list writing), and since I had a lot of friends on temporary working visas (meaning there was always a limit on their time in London) it forced us in the best possible way to do everything then and there and not put things off for another day. As they say in the classics (such a Dad phrase), “there’s no time like the present”. Locations can be found in the MAPS section, under England, London. 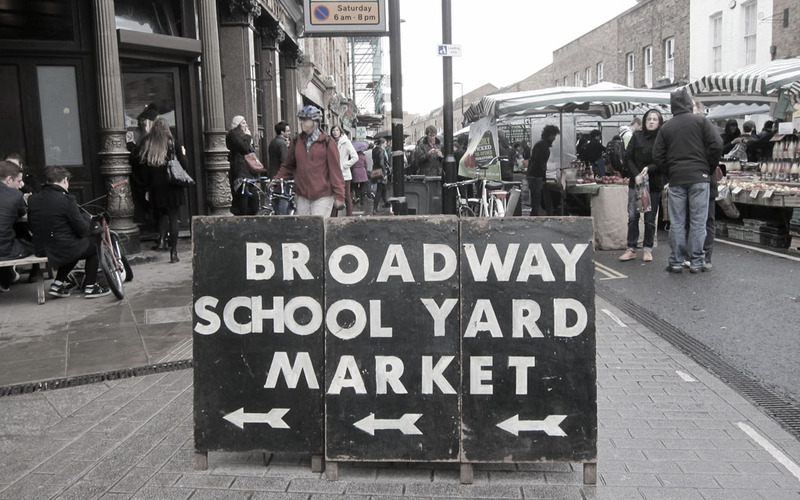 Often referred to as Borough Market’s East End cousin, Broadway Market is a melting pot of tastes and cultures – stalls, shops, galleries, pubs, restaurants and cafés offering fresh, seasonal produce and a treasure trove of vintage bits and pieces. 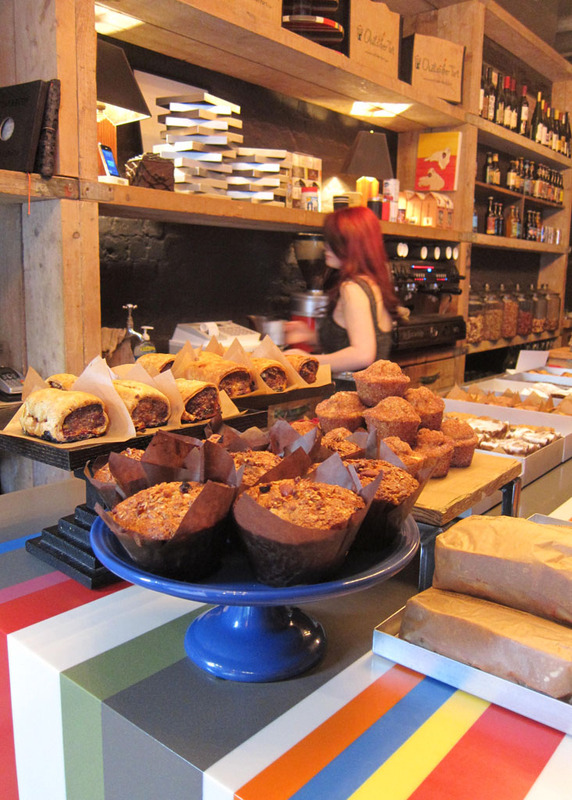 Running south from London Fields to Regent’s Canal, the pedestrian filled thoroughfare has been serving the local community with fresh goods since the early 1900s and from then until now has hosted a weekly food market. 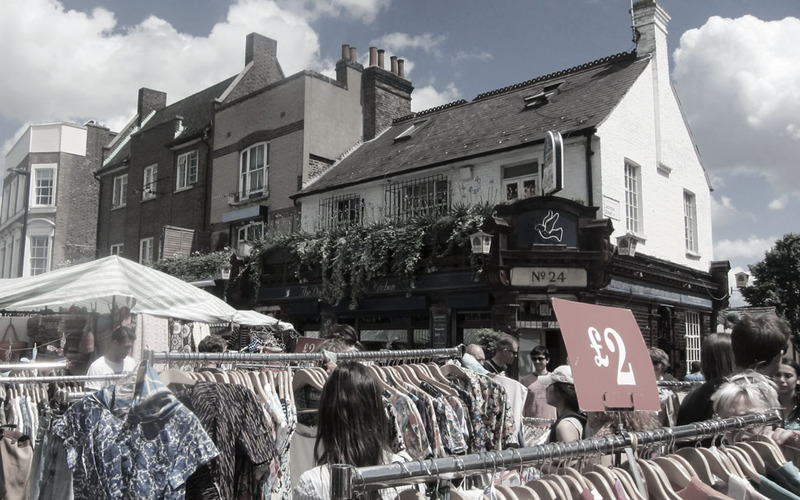 After a period of decline in the 80s and 90s, where market activity was limited to only a handful of stalls, Broadway Market in recent years has experienced a tremendous revival and expansion. Today it stands as a thriving neighbourhood hot spot. Presently, the market has over 100 stalls selling all sorts of fresh produce and gourmet goodies – organic meat, fruit, vege, seafood, dairy products, baked goods, artisanal delicacies, ethically sourced coffee and much, much more. 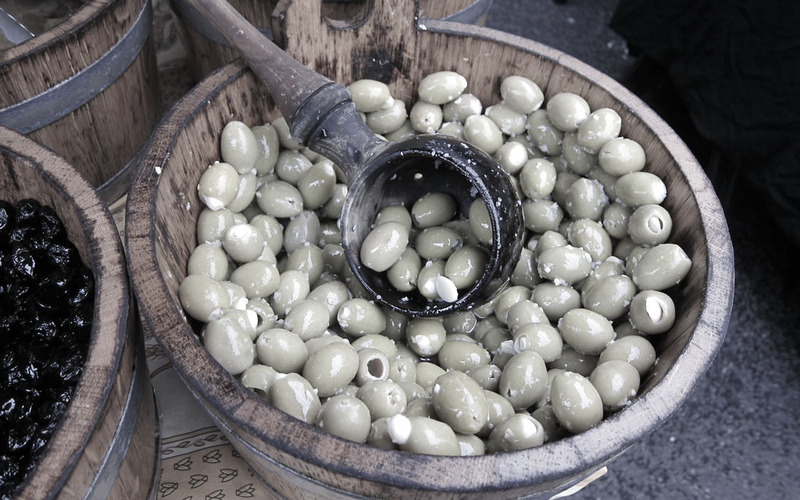 Whether you want to eat on the spot or take home and cook later, the stalls at Broadway Market are full of tasty ready to go and made to order snacks and meals, as well as seasonal and locally sourced ingredients. Every stall is unique and as tempting as the last. There are tasty pork buns (Yum Bun), cheese filled potato dumplings (The Polish Deli), authentic Caribbean stews (The Caribbean Chef), spicy vegetable curries (Gujarati Rasoi), berry cheesecake parcels and a whole lot more. Thanks to the huge selection of food on offer at Broadway Market, when I lived in London it became a place that I was more than happy to revisit. I did however have one teeny tiny issue with the market, and that was there was always way too much good food to choose from. Indecisiveness has always been my downfall. 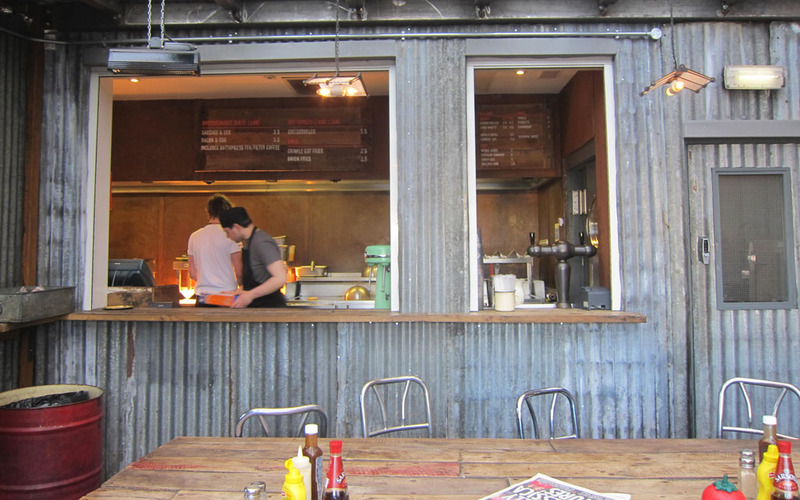 Just like the food, Broadway Market has a distinctive character and a particularly East London feel to it. 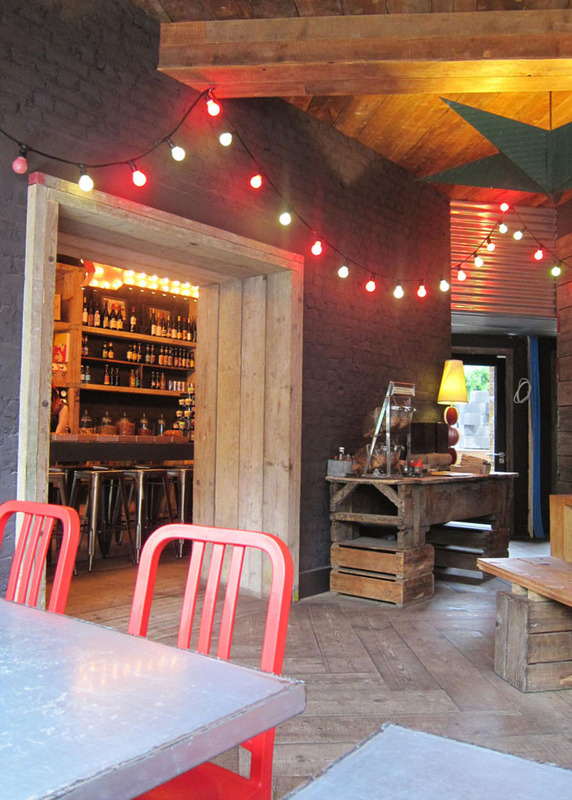 It is lively and colourful, and often full of local banter and familiar faces. Indeed the market draws far more East End residents, who come to shop and mingle than it does tourists. 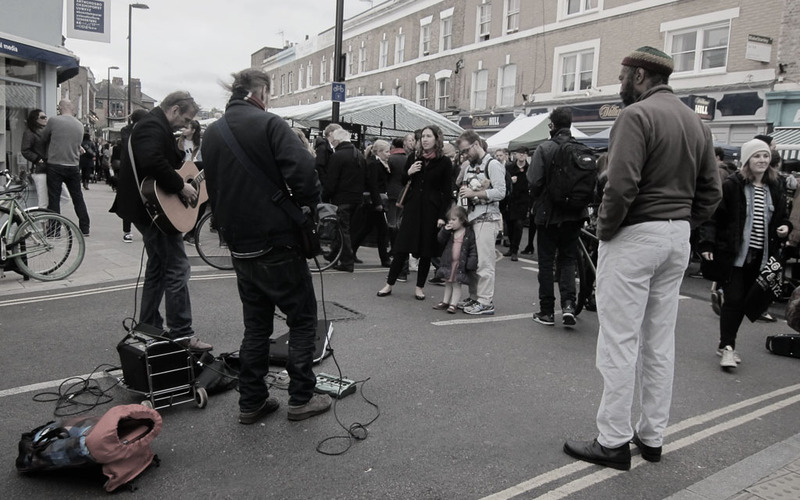 So come market day you can expect to find well-dressed Hackney hipsters, East End locals, food lovers and bargain shoppers, bouncing from one stall to another as talented buskers entertain them as they pass by. In addition to the food vendors, there are also a number of arts and crafts, and second hand clothing stalls where you can find vintage bargains along racks of pre-owned clothes, as well as handmade bags and jewellery. Once you have perused the market thoroughly, and feel confident that you have sampled enough things, I suggest taking your purchased items over to the sprawling lawns of London Fields. Then and there you can stretch out your legs and snack away on your market goodies. 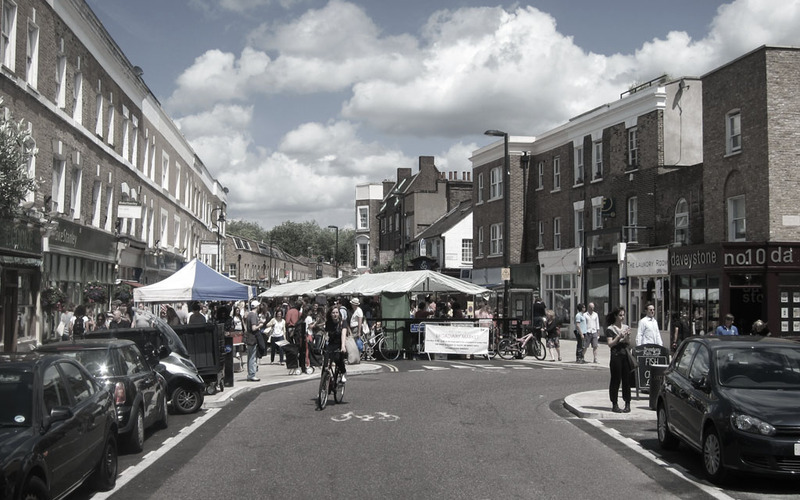 If nothing at the stalls tickle your fancy (I’d be surprised if this is the case), the stretch of road that Broadway Market runs along also boasts an impressive collection of pubs, restaurants and cafés, where diners spill out onto the street. Also, make sure you leave time to check out the neighbouring School Yard Market (an extension of Broadway Market) and Netil Market. Both markets house a small collection of fantastic and independently run stalls. Personally, I think a trip to Broadway Market is a delightful way to spend a bright, crisp Saturday morning in old London town. Central Line to Bethnal Green Station. Take the exit to the right, and walk up Cambridge Heath Road until you come to Regent's Canal, then take a left after the canal. Follow Andrews Road over to the market. Should take 15 minutes.